Uber has acquired JUMP, a U.S. bike-sharing startup in a deal reportedly valued at around $200 million. The acquisition announced on Monday doesn’t come as a huge surprise after Uber piloted “Uber Bike by JUMP” in San Francisco earlier this year. Adding bike-sharing to its mobility services seems like a natural fit for Uber which strives to “make it easier to live without owning a personal car”. In recent years, bike-sharing services, especially so-called free-floating ones, where users can just park their bike wherever their ride ends, have seen a steep increase in popularity. Public-use bicycles are especially popular in China, where they help reduce congestion and pollution in the country’s huge metro areas. 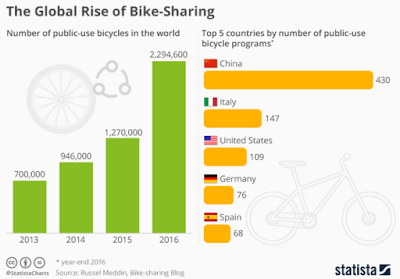 As our chart based on data compiled by Russel Meddin for Bike-sharing Blog illustrates, the number of public-use bicycles available around the world has more than tripled between 2013 and 2016. By the end of 2016, nearly 2.3 million bikes were available to the public around the world, with 1.9 million of these located in China alone. With 430 bike-sharing programs, China is the clear frontrunner in terms of bike-sharing, but as Uber’s latest acquisition shows, it is catching on in the United States as well.